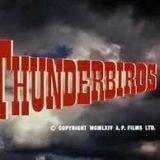 The Thunderbirds is a sci-fi Supermarionation series created by Gerry and Sylvia Anderson. Thunderbirds is set in the mid-2060s. It follows the exploits of International Rescue, a life-saving organisation equipped with highly-advanced land, sea, air and space rescue craft. The organisation is headed by a fleet of five vehicles named the Thunderbirds which launch from a secret base in the Pacific Ocean. 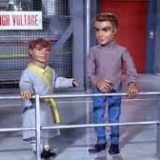 The main characters are ex-astronaut Jeff Tracy and his five adult sons, who pilot the Thunderbird machines. Trapped in the Sky – The Hood plants a bomb aboard the Fireflash, a hyper-sonic atomic-powered airliner. 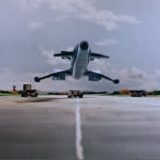 The bomb will be triggered when the landing gear hits the ground. Can International Rescue bring the airliner down safely? Security hazard – A young boy stows away on Thunderbird 2 and somehow manages to get to International Rescue’s island base undetected. The Tracies are worried when they realize how much about the day to day operations have been revealed to the boy. Jeff comes up with a unique way to get around the problem and keep all of International Rescue’s secrets.